The BF181 is a front-loaded subwoofer system, for both permanent and portable applications. 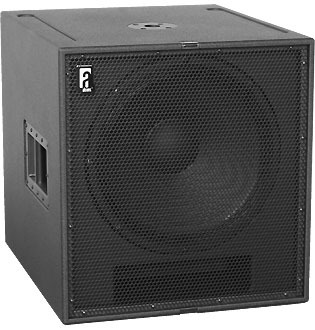 Featuring a single 18” long-excursion high-power woofer (with vented double-spider frame), the BF181 delivers high quality, tight and accurate sub-bass response. The Signal Integrity Sensing™ pre-wiring ensures complete cable/connector compensation between the BF181 and ALC. Typical applications for the BF181 include sub-bass extension of main sound systems, used in multiples depending on the application and low frequency requirements. The deep-tuning makes the BF181 an ideal highpower HiFi-reproduction system for classical, acoustical and jazz music, in combination with a VR8 or VR12 (on standmount). The 4 ohms nominal impedance makes for a good amplifier loading, when used in singles. For full system performance, the BF181 needs to be driven by an ALC controller-amplifier. Driven by the ALC, the BF181 delivers maximum sound quality and output power with dedicated and inaudible (power and excursion!) protection (SDP circuit).